42nd Street Improvement Project has been approved!!! I wanted to post some great news. Tonight the Finance Committee and City Council voted and passed for approval the entire 42nd street project, $198,043.35. Bids are approved, and we are ready to talk and get buy in with surrounding property and business …owners. We will be breaking ground soon, and hope the weather cooperates until it is completed. I will advise as new details come to light. I would like to take this time to also thank some folks behind the scenes who were instrumental in bringing this project to this point for us. First, I would like to thank Mayor Danny Jones and City Manager David Molgaard for their continued support of us in KC. I would also like to thank Chris Knox, City Engineer who put out the bids and followed up to get ready for this and who will supervise the project. Dave Gilmore with GAI Consultants for design and cost estimates for this project. Finally a great big thank you to our City Council folks for voting to support this project for KC. Can’t wait to see it happen. Thanks to all. Charleston, W.Va. (July 28, 2016) – “Neighborhoods Helping Neighbors” is a city-wide flood relief fundraiser produced by Charleston Main Streets, the Downtown Business District, Bridge Road Neighborhood Association, Kanawha City Community Association, the Charleston Convention and Vistors Bureau (CVB), WV Radio, the West Virginia Power, Proud Eagle, and the City of Charleston. Proceeds from the event will be donated to Mountain Mission to aid in their Kanawha Valley flood relief rebuilding efforts. Event details are below. 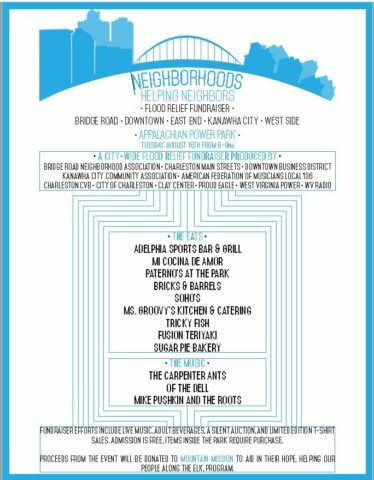 What: Neighborhoods Helping Neighbors will offer live music, a silent auction, limited edition t-shirts, local food vendors, and alcoholic beverages all under one roof at the Appalachian Power Park. Admission is free – food, alcohol, silent auction, and other items inside the park require purchase. We invite you to participate in our press conference Tuesday, August 2nd at 10:15 AM located in the Appalachian Power Park’s Suddenlink Legends Club. The Appalachian Power Park is located at 601 Morris Street. For more information, contact Steven Romano at Steven@CharlestonMainStreets.org or 304-952-4978. The Kanawha City Community Association is pleased to announce the release of our new website. If you have any suggestions or comments that may help us improve our website, please feel free to contact us at info@kanawhacity.org.